Yellow Gold Round Brilliant Cut Diamond Trilogy Engagement Ring — Form Bespoke Jewellers Ltd.
A classic yellow gold trilogy engagement ring with round brilliant cut diamonds. This stunning engagement ring showcases three round brilliant cut diamonds. All of them are of matching carat, colour and clarity and have been claw set for a neat and traditional finish. To create extra sparkle, the ring has a double bezel setting. This means that the sides of the setting (the gallery) are open, allowing more light to enter the diamonds. 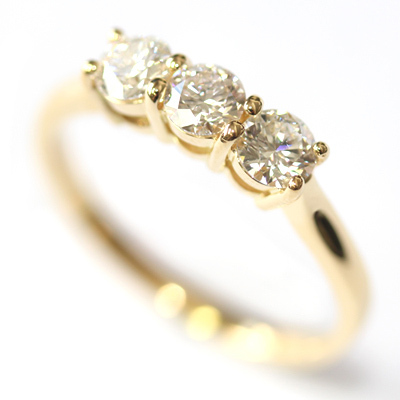 A beautiful, traditional and sparkling trilogy engagement ring.